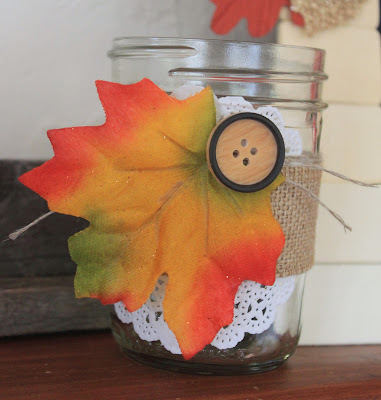 Welcome to Post #2 of my Fall decor projects series! If you missed the first two posts, you can check them out here. 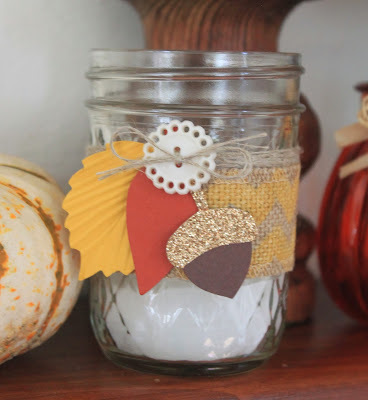 Today's project is super simple and very customizable to whatever supplies you have on hand. Grab some jelly jars, or old empty spaghetti sauce jars, and in minutes you can create some super cute candle holders! This one's a little different in terms of the supplies I used, but it still coordinates beautifully with the other projects. Doily, burlap, linen thread, button, and a faux leaf from the dollar store. Here's one of my jars "in action" with some other items on my mantel. Remember to be very careful if you're burning candles in these embellished jars. If you have paper, twine, or ribbon on the outside, it could catch on fire when you're lighting the candle! You may want to use a battery operated tea light. Otherwise, make sure you use a small votive or something similar that is entirely contained within the jar. And be careful while you're lighting it. CCC#014: Cards Challenge - Button Up!